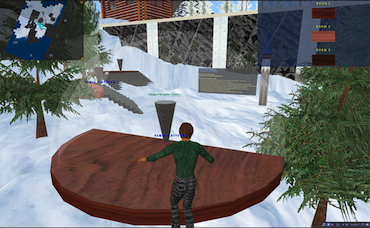 This environment consists of specially designed spaces in Second Life in communication with an external compute server that responds to events in Second Life by computing, producing, and streaming new musical results back into Second Life. The music engine is a Squeak (Smalltalk) / Seaside / C++ based process that runs on a dedicated computer. 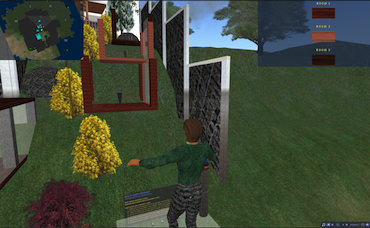 It receives requests via http from Linden scripts attached to Second Life objects that have been coded to detect the proximity between objects representing songs and objects representing particular rooms. 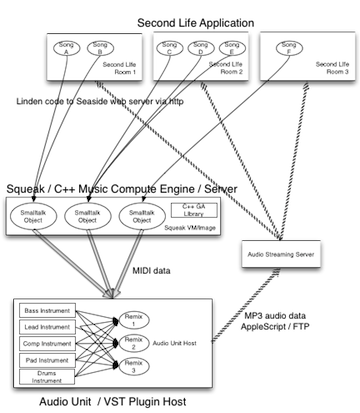 The compute server calculates new remixes, renders MIDI-based scores into audio results via Audio Units and VST Plugins, and streams the audio via Shoutcast servers to the Second Life land parcels underlying each shared musical space. The music engine / web server is currently hosted on a four-core Mac Pro. 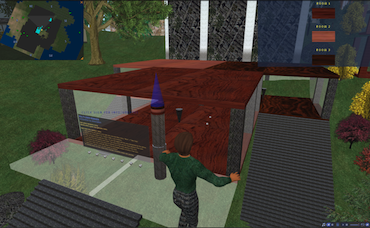 Second Life implementation: each avatar chooses a song and "wears" that song within a remix. Located at Mabinogion (194, 43, 65).